They sing in the aisles. They milk every humorous line for laughs. And they perform where a suburban audience can easily reach them. Since its founding in 2006, Opera del West performers have done all they can to make the world's great operas fun and accessible for area residents. But now this upstart troupe has a new trick for luring both diehard opera fans and the opera-wary: the choose-your-size performance. For those who want to savor every last note of Rossini's Cinderella opera, "La Cenerentola," a cast of 14 will perform the full two-hour production tomorrow at 8 p.m. For those who prefer a quicker-paced show, the same cast will perform a one-hour version at a Sunday matinee. Both will be fully staged, both will have projected supertitles in English, and the Sunday show will add an English narrator so those who don't read can keep up, too. And both will take place at the Center for Arts in Natick, where free parking is ample. "We're always looking for ways to expand our audience, and the Sunday show should be fun for people of all different ages, adults and kids, who want to try out an opera but are nervous about sitting through one for two hours," said Opera del West cofounder Eve Budnick. "There's also an older population of opera fans that may not feel comfortable driving at night, so the Sunday show makes attending easier for them, too." To make the effort work, Budnick, of Wayland, and cofounder Rebecca Grimes of Northborough knew they needed a work with broad appeal. Rossini's take on Cinderella seemed to fit like - well, like that glass slipper. "What's wonderful about this opera is that it's the combination of a fairy tale that most people know with this incredible music by Rossini," said Budnick. "It's also just such a fun and funny piece." Opera del West seems to have a knack for tailoring productions to varied audiences. The troupe's Natick debut concert in August 2006 drew so many local opera fans that the line for tickets snaked out the door. And its original children's piece, "Once Upon an Opera," was so popular last year that the troupe was prompted to deliver an encore performance and is working on a sequel. "People are often impressed with how funny our shows are," said Budnick. "People have come up to me afterward, who have never seen an opera before, and said they didn't realize it would be this much fun." Opera del West's success when it comes to exciting kids about the likes of Mozart and Strauss can be traced to a respectful approach. The music is never dumbed down; rather, appropriate pieces are chosen, and no one is left confused. A narrator always guides the youngest audience members gently through the story lines, and much is sung in English. "We didn't know what to expect, but the kids at our first children's performance were amazing. We had children as young as 3 or 4, and they sat there so quietly and intently through 45 minutes of music. Then at the end, they wanted autographs and had wonderful questions for us," said Budnick. "Some were questions about the opera. Some were about how the singers learned to sing. But they were kids. So they also wanted to know whether the jewels were real." Audience members will likely recognize a few changes to the classic Cinderella plot in "La Cenerentola," which was composed by Rossini in 1817. The magical fairy godmother is replaced by the prince's sneaky tutor. The evil stepmom is now a stepdad. And most interesting, there is no glass slipper. "They couldn't use the glass slipper when Rossini wrote it, because it was kind of risqué to show a woman's ankle in a production," Budnick said. "So they have matching bracelets instead." However, fans of Rossini's most famous work, "The Barber of Seville," will recognize the composer's festive, flamboyant style. "There's a lot of showing off. There's a lot of ornamentation and a lot of fast 'patter' singing. It's a real workout for everyone involved," said Budnick. 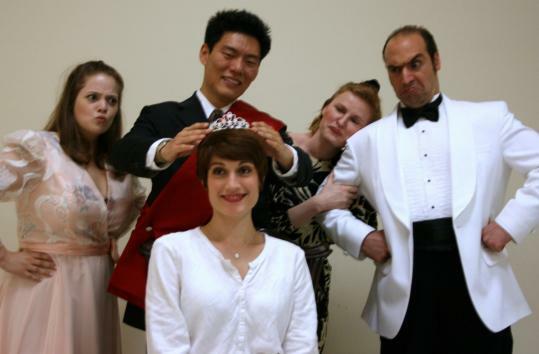 Grimes directs the mainly local cast, which includes mezzo soprano Megan Roth of Brookline (as Cinderella/Cenerentola), soprano Ruth Hart of Wayland (as Clorinda), and baritone Bülent Güneralp of Somerville (as Don Magnifico). Opera del West performs Rossini's "La Cenerentola" at 8 p.m. tomorrow (full opera) and 2 p.m. Sunday (short version) at the Center for Arts in Natick, 14 Summer St. Friday tickets: $25; seniors, students $24. Sunday tickets: $10; children $7. 508-647-0097, natickarts.org. YES, YES, NANETTE: The Reagle Players travel back to the roaring '20s at 2 p.m. today with the opening of musical extravaganza "No, No, Nanette." But the spectacular dance numbers, glitzy costumes, and madcap misunderstandings packed into this Broadway classic are not the only thrills that await. Broadway legend Donna McKechnie (who created an icon with her portrayal of Cassie in "A Chorus Line") makes an appearance as Lucille in the Waltham troupe's eight performances this weekend and next. This show has infamous Boston roots. The then-owner of the Red Sox, H.H. Frazee, also a Broadway producer, sold Babe Ruth to the Yankees to help underwrite the original version of the show, before it became a musical. As the curse was born, Nanette went on to take Broadway by storm. We can't say if it's safe to bring her back, but we can predict this will be a good show. "No, No, Nanette" will be performed today through Sunday and the following Thursday through Saturday at the Robinson Theater, 617 Lexington St., Waltham High School. Tickets: $34-$49; youths $25. Group discounts for 10 or more. Free parking. 781-891-560, reagleplayers.com. KLEZMER IN THE PARK: Be sure to bring not only a blanket and a picnic to this weekend's free Saturdays at South Street concert in Hudson. You just may need your dancing shoes too. The Wholesale Klezmer Band is coming to town with clarinet, accordion, and trombone in tow, and they'll be teaching a dance or two to anyone who wants to move to their toe-tapping tunes. The Springfield-based group has made a name for itself performing traditional Ashkenazic Jewish music, as well as contemporary original tunes. With an English translation given for every song (or "zinglid") during the 2 p.m. show, they offer a chance to brush up on your Yiddish, too. Wholesale Klezmer Band performs at 2 p.m. Saturday at Cellucci Park, 37 South St., Hudson. Rain location: Hudson Town Hall, 78 Main St. Free. 978-562-164, upwitharts.org. Have an idea for the Arts column? Please contact westarts@ globe.com.